A franking post box is a Royal Mail post box which will only accept mail which has been franked with a franking machine. It is possible to send franked mail via standard ‘stamped post’ boxes if you meet certain conditions. However, if you do this it will be taken to the sorting office with the stamped post, even though it does not need to be sorted. By using a franking post box your franked mail avoids this stage and can be processed faster. Where is your nearest franking post box? To find your nearest franking post box you need to contact the Royal Mail Business Support line (08457 950950) and give your postcode. They will be able to provide the specific locations of the post boxes in your area. If you are struggling to locate a franking post box near you, there are alternative ways to send your business’ franked mail. You can send your franked mail from your nearest Post Office. You can find your nearest branch on the Royal Mail website or by searching Google Maps. You can pay for a collection service by the Royal Mail. For an annual fee they will collect your franked mail from your business premises on a specified day. If you spend more than £15,000 on postage annually they will provide this service for free. You only post franked items once per day. Also known as business post boxes, there are two types of franking post box. You may find that some standard post boxes have a second, larger opening marked ‘Franked Mail’. However, there are also post boxes exclusively for franked mail which are bigger than the standard versions and may not be as round in design. 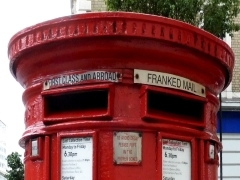 There are a limited number of franking post boxes in the UK. Why Frank Your Business’ Mail? Firstly, franking mail is significantly cheaper than using stamps. Royal Mail offer discounts on mail you have franked inhouse because of the time and effort it saves their operation. For example, from 26th March 2018 you will save 10p by franking a 1st class letter rather than stamping it and 23p for franking a 1st class small parcel. Over time these savings can be significant. A franking machine will also save you time as a business; it can process a higher volume of mail items per minute than the average member of staff. By avoiding the need for your mail to be sorted at the sorting office you avoid unnecessary delays. A franking machine can also be automated to print addresses, company logos and marketing messages to enhance your professional image and reinforce your branding. If your business sends mail on a regular basis investing in a franking machine could save you both time and money which could be better spent on the future of your business. There are franking machines for just about every size of business available to either buy outright or to rent for a monthly fee. The type of franking machine you need will be determined by the volume of mail you send in an average day. The higher the volume capacity of the machine, the higher the price. The cheapest (and lowest volume) franking machines cost from around £1,000 to purchase or can be leased from approximately £20 per month. Generally these machines are capable of processing up to 50 items per day. Franking machines with the highest capacity can process up to 180 mail items per minute and could cost up to £20,000. There are only four manufacturers authorised by the Royal Mail to supply franking machines in the UK: Neopost, Frama, FP Mailing and Pitney Bowes. Each manufacturer offers a range of machines for every size of business with a selection of features and functions designed to streamline your mailing processes. Looking for franking machine prices tailored to your business? If you’d like the best deals in the UK from franking machine suppliers please click on the banner below to complete a short form.